The Texans made a statement at home Thursday night, defeating the Dolphins 42-23. Houston improved to 5-3 and further secured its spot atop the AFC South. It has won five games in a row after an 0-3 start. The Dolphins fell to 4-4 with the loss but stayed in second place in the AFC East. Texans quarterback Deshaun Watson had an impressive night, throwing for five touchdowns and 239 yards. 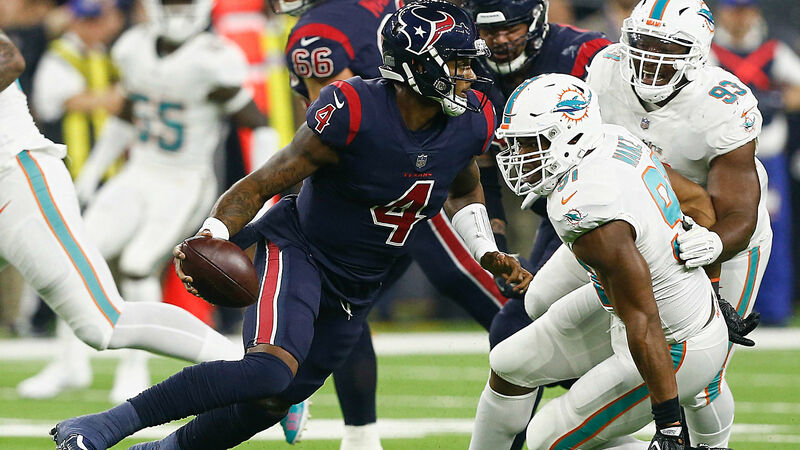 On the other side of the field, Dolphins quarterback (and former Texans starter) Brock Osweiler went 21 of 37 for 241 yards and one interception. Watson targeted multiple players on his scoring plays. DeAndre Hopkins and Jordan Thomas had two receiving touchdowns each while Will Fuller had the other one. Houston led 21-17 late in the third quarter before pulling away. The Texans broke the game open with a pair of touchdowns in the fourth quarter. The Texans head to Mile High Stadium next week to take on the Broncos. The Dolphins will face the Jets next week in an AFC East tmatchup in Miami. 11:43 p.m.: The game ends with a 10-second runoff. 11:35 p.m.: SACK. Tyrann Mathieu sacks Brock Osweiler for a loss of 9 yards. 11:18 p.m.: TOUCHDOWN, Texans. Deshaun Watson finds DeAndre Hopkins to give the Texans six more. The extra point is good. Texans 42, Dolphins 23. 11:08 p.m.: FIELD GOAL, Dolphins. Jason Sanders’ 46-yard kick is good . Texans 35, Dolphins 23. 10:59 p.m.: TOUCHDOWN, Texans. Deshaun Watson finds DeAndre Hopkins, who takes it 49 yards. The extra point is good. Texans 35, Dolphins 20. 10:55 p.m.: The Dolphins attempt an onside kick, which is recovered by the Texans. 10:53 p.m.: FIELD GOAL, Dolphins. Jason Sanders’ 41-yard attempt is good. 10:49 p.m.: Crazy play: Brock Osweiler’s pass to Jakeem Grant deflects into the air as Grant tries to catch it and lands in the hands of DeVante Parker. 10:43 p.m.: Deshaun Watson finds a wide-open Will Fuller, who takes it to the house. Extra point is good. Texans 28, Dolphins 17. 10:39 p.m.: TOUCHDOWN, Dolphins. Miami wide reciever Danny Amendola throws a 28-yard touchdown pass to Kenyan Drake. Brock Osweiler took a direct snap and lateraled to Amendola, who then threw the first touchdown pass of his career. The extra point is good. Texans 21, Dolphins 17. 10:16 p.m.: TOUCHDOWN, Texans. The Texans go for it on fourth-and-goal. Deshaun Watson scrambles and completes a 2-yard pass to Jordan Thomas for the score. The extra point is good. Texans 21, Dolphins 10. 10:10 p.m.: Lamar Miller goes 58 yards up the middle, putting the Texans in the red zone. 9:54 p.m.: The players exit the field as the half supposedly ends but are called back after a penalty is called on the offense. The officials put 15 back on the clock. Houston backup Brandon Weeden takes the snap for the ensuing kneeldown. 9:48 p.m.: Josh Keyes sacks Brock Osweiler, forcing a fumble. The ruling on the field is a touchdown after the fumble is recovered by Natrell Jamerson. After further review, the play is ruled an incomplete pass. 9:34 p.m.: FIELD GOAL, Dolphins. Jason Sanders’ 37-yard attempt is good. Texans, 14, Dolphins 10. 9:08 p.m.: TOUCHDOWN, Texans. Deshaun Watson’s first passing touchdown of the night goes to Jordan Thomas. The extra point is good. Texans 14, Dolphins 7. 9:05 p.m.: INTERCEPTION. Julie’n Davenport intercepts Brock Osweiler’s pass intended for Danny Amendola. 9 p.m.: TOUCHDOWN, Texans. The Texans answer with a 2-yard rush by Lamar Miller. The extra point is good. Dolphins 7, Texans 7. 8:56 p.m.: Deshaun Watson completes a 34-yard pass to Will Fuller. 8:49 p.m.: Jason Sanders’ 42-yard field goal kick is good but a Texans penalty gives the Dolphins a first down in the red zone. 8:33 p.m.: The Dolphins go for it on fourth down but are unable to convert. The Texans will take over on downs. 8:24 p.m.: We already have a penalty: illegal formation on the kickoff, by the Texans.